This relatively minor alteration to the oligonucleotide can have profound effects on the function of the oligo within some molecular methods and applications of oligos. For example, occasionally in the design of a dual-labeled hydrolysis probe for a qPCR assay, the length of probe sequence is required to be quite long to achieve the proper predicted melt temperature (Tm). In this situation, for probe designs that are 30 bases or longer, we recommend moving the BHQ® (Black Hole Quencher®) dye modification from the 3’ end of the oligo to a position internally within the sequence. Putting the quencher in closer proximity to the fluorophore is more ideal because longer probe sequences typically exhibit less efficient quenching. While moving the quencher to an internal position creates a simple solution to the quenching efficiency issue, this also creates another problem in which the 3’ end of the oligo is left unmodified. This probe construct would allow the probe to act potentially as a primer in the qPCR reaction! This is certainly a problem if you intend to amplify a single specific product in your reaction. The addition of the 3’ Spacer C3 can quickly fix this situation by blocking extension at the 3’ end of the probe. This allows your long probe design to be well quenched and not act as a primer in the reaction. Improved quenching, but can act as a primer! Improved quenching and block polymerase extension. The utility of Spacer C3 is not just limited to qPCR applications. 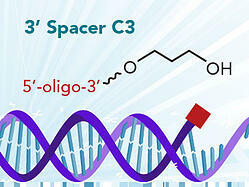 The addition of the 3’ Spacer C3 can be utilized in a number of other molecular methods where a non-nucleoside blocker is required to prevent the 3’ end of the oligo from reacting with an enzyme. For instance, the short 3’ carbon spacer can also provide resistance cleavage to other enzymes such as 3’ exonucleases. Clearly, this modification could have a wide range of potential in various molecular applications. This simple yet versatile modification is perhaps an underappreciated member of the full line up of modifications in comparison to its more sophisticated cousins. However, it confers some excellent properties to an oligo, which are critical to the operation of methods such as qPCR. For more modifications, see our custom oligo modification pages or contact techsupport@biosearchtech.com for any questions about custom oligos. We also provide CPG and columns such as a 3' C3 Spacer CPG Support if you wish to synthesize your own oligos.